Today I bring you a tiny bunny. It is about 2.5in or 6.35cm long not including ears. This bunny actually evolved from one of my recent free patterns, Barley the Bear. I changed up some of the parts, including making a bigger head, to make this bunny. I've also made a zombified version. The zombie parts will be up next, check back for updates. 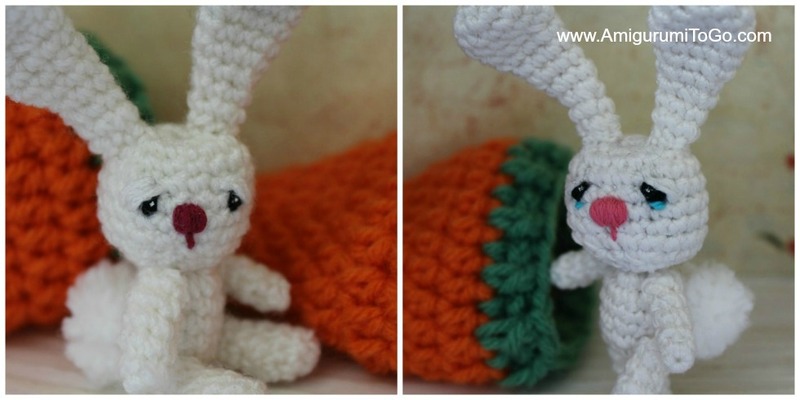 The carrot pouch was designed specifically for this bunny, free pattern here. Now you can scroll down this page for the bunny pattern, look at the bottom of the page for the print friendly button. To get the same sized bunny there's 3 options that I've used. One option is a sport weight yarn, that's a #2 fine. The 3rd option is splitting yarn. Look at the cover photo above, the bunny in my hand, and the beige bunny head below were made with sport weight yarn called "Luster Sheen" from Red Heart Yarns. The one standing was made with 2 strands of embroidery floss. Darning needles for sewing. I used 2 different sizes. Size 13 blunt end for the sewing (I thought this would be too big but it worked great. I switched to a much thinner, sharp end needle (size?) to do the eyes and nose. The sharp needle isn't so necessary but it's great for getting the thread exactly where you want it. *Now to the pattern. Please feel free to play around with it. Add or take away as you wish. There is a step by step assembly section that tells you where to put the eyes and so on at the bottom of the pattern. IF you would prefer to put the eyes in and sew the ears on before stuffing the head then do this step at the end of row 8. I always find it easier after the head is stuffed and closed. There's no right or wrong way, it's just what you find easiest for you. I wrote some notes on doing eyes in the assembly section, I hope it's helpful to you! Look in steps 3 and 4. This bunny is not for small children due to choking hazard. stuff the head, push stuffing to the sides to make the head more of an oval shape. 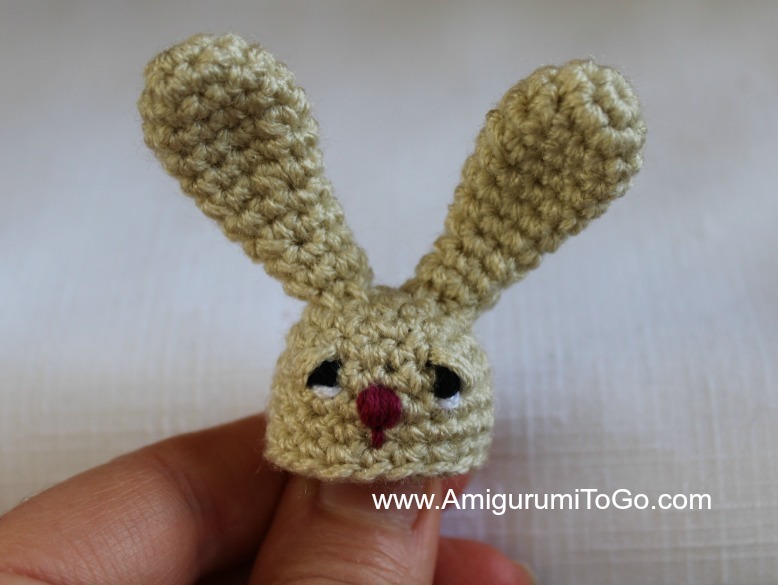 You will need to reshape a few times as you sew the bunny together. Stuff the body. Weave in and out of the reaming stitches and pull to close the gap. 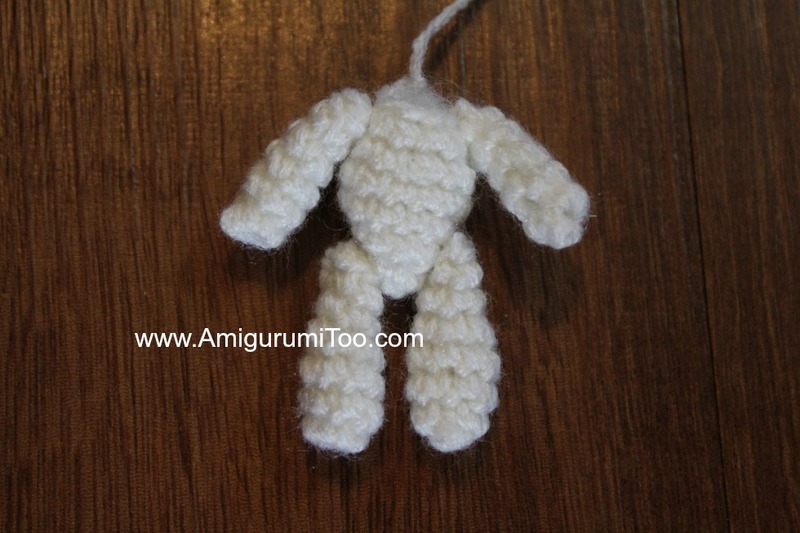 Leave the yarn tail, this will be used to sew the head and body together. 7) 1hdc in next 2st then sl st next st and f/o leaving a tail for sewing. sl st next st and f/o leaving a tail for sewing. Do not stuff ears. You can buy tiny pom poms or you make your own. Wrap yarn around your index finger about 20 times. Pull the wrap off your finger and tie around the middle using a strand of yarn the same color. Pull tight and knot off. 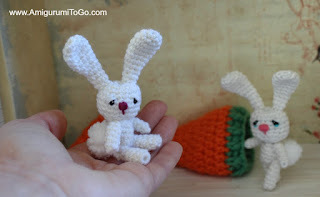 Leave the tie tails long, you can use these to sew to the bunny and also hang onto them while you trim the pom pom into shape. 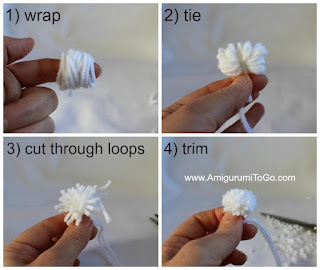 Cut through all the loops and trim to shape your pom pom. If you need further help, I do have a video for making one, a bigger one but it's done using the same steps. View video here. 1) Sew the legs to the body. You can sew the 2 ways, jointed or not jointed. To joint, thread the finishing yarn tail through the middle of the hdc's. Place the limb against the body, the hdc's should be on the outside, think of them as shoulders for the arms and hips for the top of the legs. 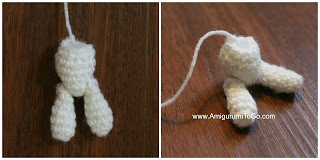 Pull yarn tail through the body and out the other side, then go back through the limb and back through the body again. Make sure to adjust things until they sit right. This part is a bit finicky but if you take your time then it will look batter when done. Pull real tight, you should be on the other side of the body from the limb you're attaching, then knot off. Hide yarn tail inside body. 2) Sew the arms now. You have already closed up the top of the body, although, in my photos it shows I didn't. It will work either way but it's easier before sewing the arms on. 3) Sew the ears onto the head before sewing the head and body together. The ears are up high, sewn over the 2nd and 3rd row. 4) Add the eyes and nose. I added eyes by wrapping yarn vertically over the 5th row with about 3 visible stitch holes between them. 2 or 3 wraps should do it. I also added a bit of character to the eye by wrapping the body color over the eye, on a slant, going over the outer part of the eye. I wrapped 2 times. This shapes the eye. If you wrapped over the top, not so slanted, you could have a sleepy looking eye. Add some color by wrapping color of your choice, horizontally across the bottom of the eye. Add a dot of white paint to give the eye some life. Whip stitch a nose in place. I wrapped a number of times over the 6th row. Play around with these ideas, or use your own. It's totally up to you how you want the face to look. Have fun with it! 5) Sew the head and body together. I made the head jointed by weaving the finishing yarn tail in and out of the remaining stitches of the body and pulling the yarn tail tight until the gap closes. Then pull the yarn tail up through the head, pulling the body and head together. Then bring the yarn tail back down through the body, over a stitch, knotting it off at the bottom of the body. You will have to pull the head back into shape before knotting it off if you pulled a little too tight. The head on my bunny can twist all the way around. 6) Sew or hot glue the pom pom to the back of the body. And you're done! I hope you enjoyed this pattern. 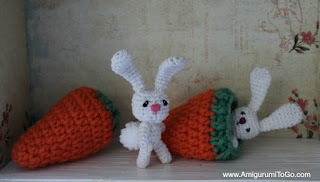 If you would like the bunny to have something to hide in, make a small carrot pouch. I have a free pattern right here. THANK YOU for sharing. Your bunny and the carrot pouch are very cute. Plan to try making one of each tonight. If all goes well, more will follow and I'll have some delighted nieces and nephews this Easter.